I liked this comment thread started by Sanna but followed up with a conversation with Moni. I love it when someone says one small thing that changes the mindset of someone else in a positive way. Thanks Moni for helping Sanna see her stuff in a new light. This comment from Maggie shows she is progressing well with her decluttering and learning about establishing new good habits along the way. Well done Maggie! I love it when my readers have come so far that they are now able to help others with the decluttering needs. Deb J tells us in this comment how she is about to help out her friend. I likes what Jane had to say in this comment about not having to directly ask people not to give toiletries as gift. I haven’t read much from Leo Babauta of Zen Habits lately but after reading this I think I should pay more attention to what he has to say in future. He is Leo’s tips on How To Live Well. I am equally appalled and amused by the items feature at unclutterer.com on Unitasker Wednesdays but seriously this item would have to be the most ridiculous I have witnessed so far. Declutter fiddly little kitchen items that have fallen under the radar but aren’t useful enough to keep. This small group of kitchen items are being decluttered for a number of reasons ~ don’t use, excess to my needs, don’t have a use for and unwanted items brought in by someone else. Most went to the thrift store. The off switch on the TV remote control. It get used by me the instant my husband walks out the door in the morning and peace reigns for the rest of the day. Wow! You’re early today, Colleen! However, interesting links as always. Thank you! Ah, silly me I was groggy from anaesthetic yesterday and must have hit the publish command before setting the time. Never mind. Hi Colleen – it worked well for me as we’re two hours ahead of Oz. Moni, you were probably already in bed when I published it. I think Tanya of Minimalist Packrat went back to work. I miss reading her blog! What a shame I though she was doing so well with it. Good comments and links. The 16-step guide is a hoot. Reminds me in a way of how I felt one day when I walked into our house. Everything I did that day made me realize that I needed to change things. Tanja and Patrick moved to Arkansas and are “in process”. She has been commenting on comments from her last post with comments made in late April. I think she is getting to the point where she is ready to post again from the sounds of a couple of her comments. Leo has a lot of good stuff. I always enjoy it when I take time out to read him once in a while. The Unitasker item is just ridiculous. I can’t imagine. Didn’t Tanja and Patrick just build themselves a tiny house in their last location? Now they have moved on already?? Yes the Unitasker item was beyond stupid. All I know is that they are ridiculous and no one in their right mind would wear them. I recently saw a unitasker that was hilarious. you know the brezels we have in germany? I saw an ad for a Brezel cutter – you place the brezel inside a slim metal box (like a large cigarette case) and then you pull a metal string all the way through it. you open the case and Voilá! you have a nicely parted brezel. You cant use it for anything else of course, but I guess for those little snack bars that sell hundrets of brezels everyday, that item might even come in handy. While reading today’s comments I had a completely different take on stocking up. It’s not always a bad thing. I live in an out of the way town and travel to the big cities once or twice a year. Sometimes people visit me. Either way, I use those occasions to stock up on things I know I like and use. I buy enough to last until my next trip. This saves me having to shop online and pay outrageous shipping costs. At the same time I have learned to focus so that my enjoyable trips don’t turn into mere shopping expeditions. But I did think it worth noting that sometimes stocking up does make sense. That is true delores, stocking up does make sense in certain situations but for about 90% of people it doesn’t. Smart of you to learn to focus so your shopping is efficient and doesn’t take over the entire trip. Hi Delores – I have friends who live far out in the country and so groceries have to last several weeks, so yes they stock up. My friend has it down to exact figures how much of each item she needs. She uses an online supermarket, but obviously they don’t deliver out to the back of beyond, but they have a $3 option where they assemble her order and she collects it at a pre-arranged time, do you have that option? Hi Colleen – the food colouring brought back a fond memory for me during my last pantry “cull” – I found black food colouring. Yes, Black! One of my daughter’s and her friend decided to be patriotic during a major sporting event last year and made black banana cake. (black and silver are our national colours) – suffice to say, visually it lacked some appeal…….however supportive we may be to our sports…..black banana cake???? I’m not sure I could get past black banana cake! Hi Becky – it was comical watching the dads trying so hard not to disappoint their ‘princesses’ who looked so hopeful – black cake, black icing……I just cut a small piece and kind of mangled it while looking like I was eating it. I remember reading about an experiment with colouring food once. They coloured an entire meal green and most people didn’t eat well. Then the same people were fed the same meal in the dark there they couldn’t see the coloured and enjoyed it. So visual appeal is important when it comes to food. 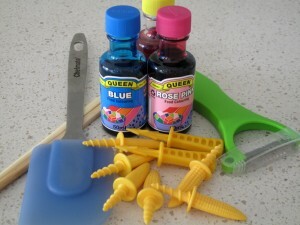 The food colouring I decluttered was bought by my son’s x girlfriend. She liked to make cakes when friends had parties. She lived out of town and used public transport so it made more sense to use my kitchen. Considering how that relationship turned out I appreciated that clutter even less. I guess if you are only using the vanilla as a deodoriser it doesn’t matter how old it is. When it comes to the microwave I don’t even utilise the bowl. I thoroughly dampen the cloth I am going to clean it out with, put that in the microwave and heat it for 30 seconds, leave it in there for a minute or two and then wipe out with the warm cloth. I’ve been snickering all day ever since I read the words “fiddly little kitchen items”. Jane ~ I am not sure what is so funny about that but I am more than happy to been the source of your amusement. I’m not sure either – but it’s tickled me silly all day! oh lord, I need to catch up on this weeks comments big time. I had some really nasty decluttering yesterday. someone stole my smartphone with all numbers. I am sooo mad. you know the ironic part is, that I decluttered my adress book WITH all those numbers 4 month ago, when and because I got the phone. So I will learn my lesson and get a paperbook for adresses and numbers again. because that wont get stolen. And I wont rely on oh-so-fancy-smart-phone-technology anymore. because that can go away with a click. or a thief. back to the old phone, back to paper, back to work. I am so sorry you had to suffer this situation. The beauty of smart phones is it is usually easy to share the information in them to your computer. Although I can’t say I have done that because I have kept my address book. That being said the address book only has information for people who have been in my life for a long time. I would have to catch up with my newer friends to find out their details again should my phone get stollen. Sometimes I think technology has complicated our lives as much, if not more, than it has enhanced it. yeah, haha. I never synchronized the data from the phone to my computer, because I really dont like to get into new software and technology again, so I pushed it. I have been living for a day without a mobile phone now. and you know what. its really nice somehow, like I feel relaxed, and I cant really tell you why… I gave my home number to my friends and I sent out emails, and thats it. if I want to contact someone I will find a way to get the number eventually and can then call there. I will get a new SIM card on monday and use my old mobile phone. I am now planning on ignoring it a bit more in the future. this item really costs time and energy, not just directly by checking and texting and playing and whatever stuff you do with it, but also time spent learning “how to …”. I wont spend so much time on it anymore. What are those yellow things?! ?